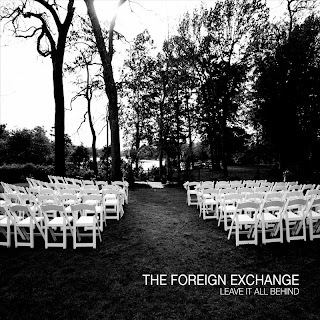 Four years after the release of their critically acclaimed debut "Connected," The Foreign Exchange returns with their sophomore set, "Leave It All Behind." Consisting of singer/songwriter Phonte and producer Nicolay, The Foreign Exchange came together via Okayplayer.com in 2002. After trading files through Instant Messenger for over a year, Nicolay (living in his native Holland at the time) and Phonte (a Raleigh, NC resident) completed their debut album before they ever met each other in person. The album, "Connected," was released in 2004 to positive reviews, and was praised by legendary DJ's such as Jazzy Jeff, King Britt, and DJ Spinna for its inventive mix of hip-hop, R&B, and electronica. "Leave It All Behind" finds The Foreign Exchange much closer in geography (Nicolay has since become a resident of Wilmington, NC), but located much further from their hip-hop origins. The duo's second full-length is a dark, multilayered affair that features Phonte showcasing his abilities as an exceptional lead and harmony vocalist, while Nicolay extends his musical palette to include sprinklings of jazz, downtempo, and house. The lush, Darien Brockington-assisted "Take Off the Blues" picks up where Connected's sleeper hit "Come Around" left off, while the complex polyrhythms and dreamy synthesizers of "Sweeter Than You" are described by Phonte as "swing jazz for the next century." Marc Mac (of legendary UK production team 4hero), also contributes a string arrangement to the duo's glorious cover of Stevie Wonder's oft-forgotten 1991 gem, "If She Breaks Your Heart." In addition to appearances from longtime FE affiliates Darien Brockington and Yahzarah, the album also features guest shots from producer/keyboardist Zo! and vocalist Muhsinah.